Elisabeth Holmqvist Saukkonen showing her samples. A couple of weeks ago I went over to Helsinki to meet with Elisabeth Holmqvist Saukkonen and deliver the battle-axe pottery sherds I had selected for analysis (see previous entry). I have primarily selected a few settlement sites in Eastern Central Sweden where the material found seem to exclusively belong to the earliest phase of Battle Axe culture. There are a few of these to be found, especially in this region of Sweden since there was a tradition of moving to a new spot in the landscape after perhaps a couple of generations, possibly connected with slash-and-burn agriculture (though this is conjecture with scant ecological evidence backing up at this point). The sites I choose are situated in Södermanland (Barrsjö, Dunker parish and Lilla Malma, Hagtorp parish) and Närke (Vallby, Kil parish). I also selected sherds from a couple of Battle Axe burials found at Rötved, Fjälkestad parish in Skåne in the south of Sweden. 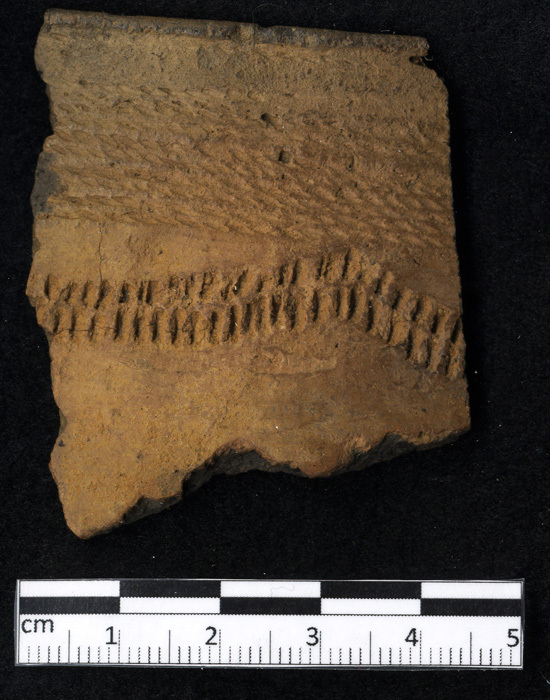 In addition there are a few Funnel Beaker (TRB) sherds from the settlements included as well, in case we have time to compare them to the battle-axe sherds. It is a remarkably regular occurrence for early Battle Axe sites to be connected with Early Neolithic Funnel Beaker sites – with a 500-600 year gap between them (a subject for another post). Elisabeth met me on a Saturday at the department, because us academics just don’t know how to separate work day from holiday. She showed me sherds from Finnish Corded Ware sites (e.g. Perkiö, Jönsas etc) that she was currently analysing. She also kindly took the time to show me the samples she cut from the sherds and the images and scans she had done on them, trying to explain the method to me in a manner that I could comprehend. 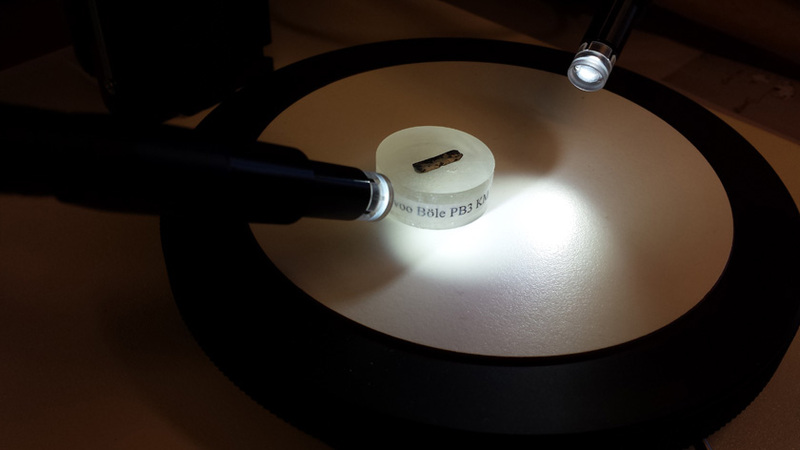 Some of the sherds we are analysing have already been analysed with thin section analysis at the Ceramic Laboratory at Lund University. I find this to be an eminently usable method to study general craft practices and choices in most cases. What the scanning electron microscope can do however, is to really focus on specific spots in the sample, possibly revealing if the clay has been processed. It can also in the case of corded-ware pottery look at the inclusions of grog temper which is crushed brunt clay and/or pottery and potentially see if this deviates from the paste used. Elisabeth will now continue her series of analysis on the Swedish sherds and hopefully we will have something of interest to present at the EMAC conference in Padua in September. Sherd of a Battle Axe beaker found in a burial at Rötved, Fjälkinge parish, Skåne. I recently received a grant from The Berit Wallenberg Foundation to kick off a project called The Introduction of Battle Axe Pottery in Sweden. Battle Axe culture is a regional version of the Corded Ware culture complex which in the 3rd Millennium BC spans an area from the Netherlands to Finland, Sweden to Ukraine. What this phenomenon, usually manifested in crouched inhumation burials containing finely crafted beakers and/or battle axes, actually represents continues to be debated within archaeology since the early 2oth Century. There are many similarities between regions, but there are also notable differences. Is migration or diffusion of ideas the main means of the spread of the material culture? A combination? How can we tell the difference? In my dissertation I focused on the relationship between the Battle Axe culture and the Pitted Ware culture which both preceeded it and was contemporary with it in parts of Sweden. One aspect that really caught my attention was that of the pottery traditions which differed in many notable ways, not just superficially as in decorations, but more profoundly in craft choices and social organisation of that craft. Battle Axe pottery represents a technological break with previous traditions and seems to appear as a fully formed craft with little or no variation or learning curve. This is in contrast with the stone technology and settlement patterns which have considerable overlap with the Pitted Ware culture in Eastern Sweden and the Funnel Beaker culture in the South and West. Swedish Battle Axe pottery differs in some ways from ”classic” Corded Ware pottery found on the continent, including Denmark. 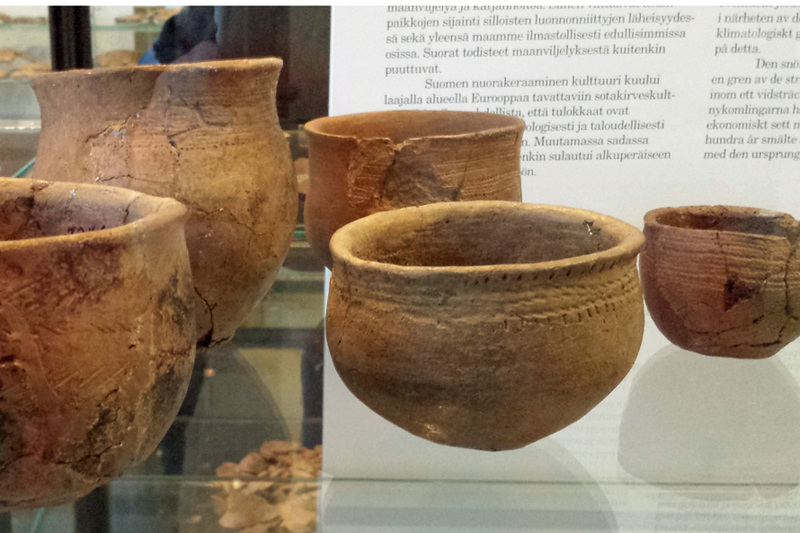 It is remarkably similar to certain regional types of Finnish Corded Ware however. I was therefore very happy to be approached last year by Dr Elisabeth Holmqvist-Saukkonen of the University of Helsinki, who has started a major project called Untangling Corded Ware: Provenancing Battle Axe Culture Pottery of Southern Finland, financed by the Academy of Finland. 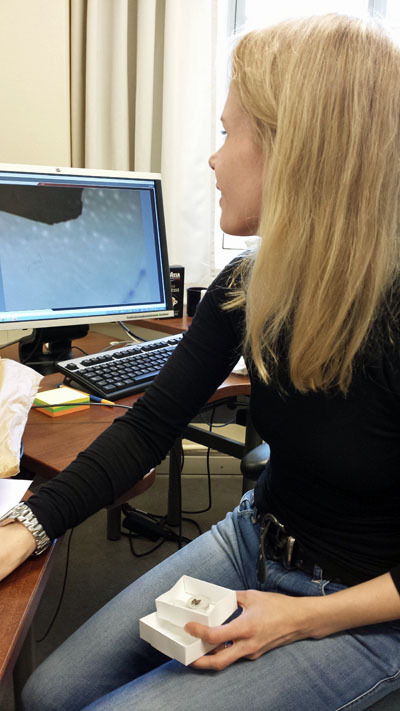 Elisabeth does laboratory analysis on pottery using scanning electron microscopy (FESEM-EDX), investigating the micro-structure of ceramic fabrics. In the case of corded-ware pottery this is doubly interesting as it is generally tempered with grog: crushed sherds of older pots. With the backing of the Wallenberg Foundation and the generous permission of the Museum of History as well as the National Heritage Board here in Sweden, I have now selected a number of battle-axe pottery sherds to be analysed by Elisabeth. 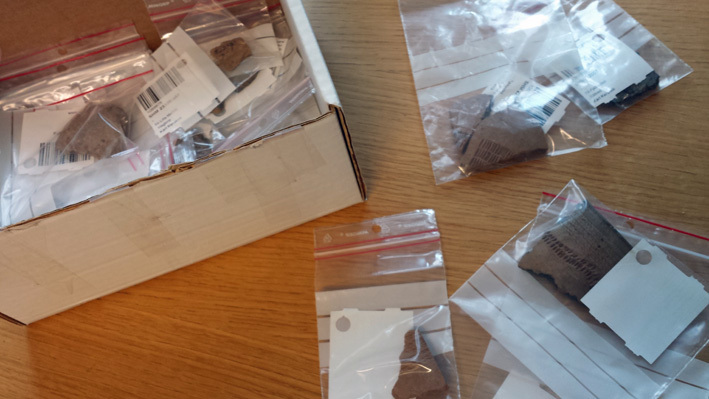 These will be compared to the Finnish corded-ware sherds she has already analysed. I just finished photographing them and this weekend I’ll bring them to Helsinki.